July 1, 2012 - Flight Training International (FTI) announced its new Airline Transport Pilot (ATP) course for commercial pilots. This course was specifically designed to allow pilots with B737 experience to upgrade their commercial certificate to an ATP during their annual recurrent or re-qualification training. According to Captain Joe Delisle, Chief Pilot of FTI’s Miami Campus, and B767/A320/A330 captain, “holding an ATP and a type rating demonstrates to airlines that you can make it through their training program. 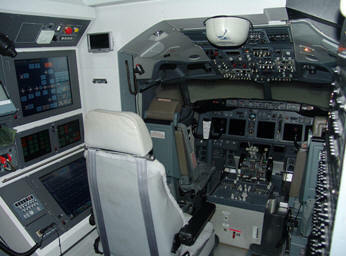 Pilots who are not type rated on the B737 but have experience in type are also eligible to complete the ATP course. Training is completed in two to three days and concludes with a Practical Test Standards (PTS) check ride that satisfies the requirements for an annual proficiency check or re-qualification check on the B737. An upgrade course is also available to pilots who would like to add the B737 type rating at the same time they earn their ATP certificate. “We added the B737 ATP course to help commercial pilots earn an ATP during the course of an annual proficiency check or re-qualification course. Exceeding hiring minimums by adding an ATP certificate is a cost effective way to appear more attractive to airlines that use a point system in their hiring process. While many carriers list a commercial certificate as the minimum hiring requirement, an ATP has always been the real requirement for those who want to be competitive for a job with a major carrier. "In fact, new regulations will require all crew members operating under Part 121 to hold an ATP beginning in 2013. As the stagnation created by the Fair Treatment for Experienced Pilots Act, commonly known as the age 65 rule, comes to an end later this year, we anticipate significant seat movement once again in the industry. This course allows pilots to become more marketable by earning a coveted ATP certificate,” says Mike Medley, president at Flight Training International. As older pilots retire, another pilot must be trained to take his place. Of course, the pilot who moved up one spot must also be replaced, and so on, all the way to the junior pilot who is replaced by a new hire. “Holding an ATP is one of the keys to getting an interview first and getting an interview is a prerequisite to getting hired. It’s important to get hired first, in order to gain that all important currency in the airline industry: seniority,” adds Delisle. “Industry insiders are telling us that many air carriers do not have enough organic simulator capacity to meet their upgrade and new hire training needs. As a result, major carriers will be purchasing large blocks of simulator time on the open market from the major providers such as Boeing and CAE. This will create a shortage of simulator time for pilots trying to schedule training on their own. Implementing the course now helps pilots beat the rush and earn their ATP while simulator time is still readily available” says Medley. Pending requirements for all part 121 crew members to hold a type rating will further increase demand for simulator time. New hire courses will be lengthened so that first officers can meet the requirements for an initial type rating. The additional time used by 121 pilots will leave less time available for sale to individuals seeking simulator training. “Flight Training International’s new ATP course is only two to three days, so it's an affordable way for pilots to become more marketable,” says Medley. “We are seeing pilots, who want to beat the rush, reserving their training time now, before these major industry changes happen,” says Delisle. FTI plans to add an ATP course for A320 pilots as well, in the upcoming third quarter. ATP courses will be available for more than 20 type model series by the end of the year.